New! You can get a beta version of the next Unknown Devices with Windows Vista support. I will be posting new beta versions as features are added but please give it a shot and let me know if you have any issues at catfish@halfdone.com. The beta version works with Win95, 98, 98se, 2000, XP, 2003 and Vista. Added Zip file support (Don't extract DeviceLists.zip). Future version will allow using zip or not. Now works on the device lists in memory, in most cases will detect faster, expecially from older systems and slow drives (like floppies) at the expense of using more ram. Improved Win9x detection (Thanks Cliff). * Download latest pci update at Craig's website (right click, save link/target as...). 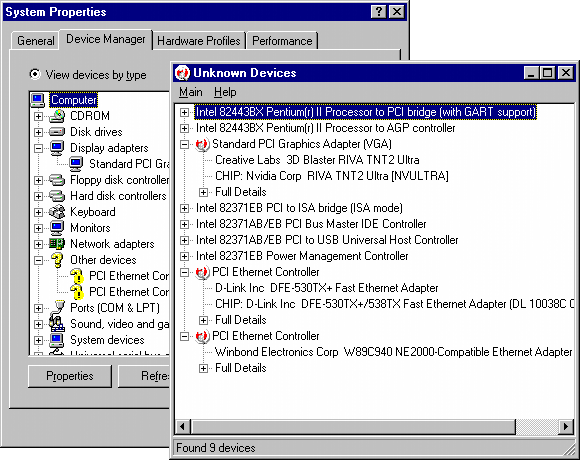 Unknown Devices helps you find what those unknown devices in Device Manager really are. By checking Device Manager for unknown devices and extracting information from it, this program attempts to figure out what the device is. You might not have to open your case or look up random numbers off of PCI cards to figure out what they are. Program supports Win95, 98, 98se, Me, 2k, XP and 2003 but not NT. It also attempts to support future OSes. It runs fine from a CD or floppy. It's free for personal and (especially) business use. The program contains no adware, spyware, malware, popups, or whatever is the latest name for junk software. If you want to add it to a cd collection or magazine that is fine, just drop me an email. Download the latest pci list from Craig Hart's Page (3rd download from the top). 35120 Downloads since July 20th. ~7000-10,000 before that. 28845 Downloads since July 20th. 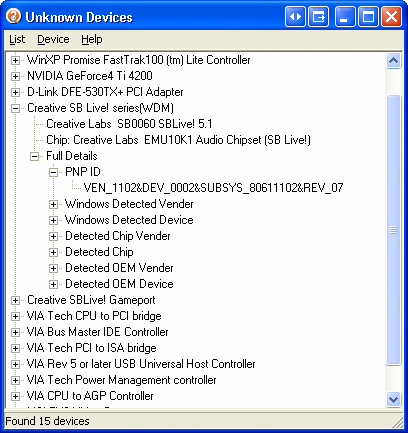 Sherpya from netfarm.it has created a PEBuilder plugin for Unknown Devices. You can get it at http://oss.netfarm.it/winpe/. You can learn more about PEBuilder (a cd bootable version of WindowsXP-03) at http://www.nu2.nu/pebuilder/. When you setup a PEBuilder CD you will have an option to ADD a plugin, just point it to this cab file. Borland C++ Builder 5 source code. Only for programmers, not for Huntersoft. 25225 Downloads since July 20th. You can download Version 1.0 here and You can download Version 1.1 here. Rip off, last update Nov 2nd 2003. A Message to Huntersoft, last update Apr 25th 2004. CPCW Magazine wrote an article about copyright issues, Chinese style. Here is my comments about it, last update Apr 25th 2004. I think we should email him and his Order process companies and complain! Latest pcidevs.txt, see About->Updates or pcidevs.txt itself to learn how to update it yourself. 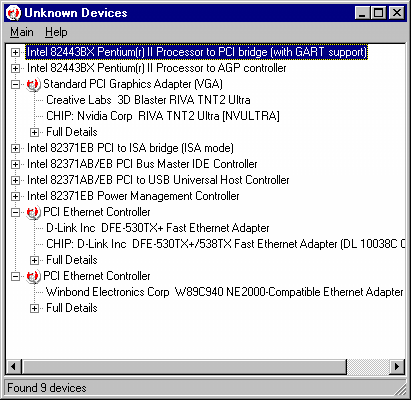 This program only knows about PCI and AGP devices. It will not be able to help with ISA devices, original PCMCIA cards, USB, SCSI, firewire..etc except for the controllers for these devices. This program might not display the unknown icon for some devices even if windows really doesn't know what it is. If you see one please email me with the EXACT name windows detects it as like "Standard PCI Graphics Adapter" so I can add it. Also this program shows all devices found in the registry including devices that no longer exists! Will be fixed when I figure out how. PCI detection is provided by Craig Hart's pcidevs.txt. See his webpage at http://members.datafast.net.au/dft0802 for updates to the file and more info. Please email me here at catfish@halfdone.com with any bug reports or suggestions. Let me know if this program has helped you out! If you find any unknown devices that this program says it doesn't know about, please provide this info to Craig Hart or email it to me and I'll pass it along. See Craig's webpage for details. If you happen to know how to find out, using the registry, what devices are present or not present and/or If you know where you can get a complete list of unknown devices as windows reports them, like "Standard PCI Graphics Adapter" and "PCI Multimedia Audio Device" or even better know how to tell if windows knows it's an unknown device, drop me a line at catfish@halfdone.com. Especially under Win9x-ME. Thanks. Page last modified: March 12th, 2012 - 9:47pm Boston, USA time. 5,222,952 Hits on this page since July 20th, 2003. Page loaded in 0.027 seconds.